“You can’t please everyone, and you can’t make everyone like you.” These words of wisdom from news anchor Katie Couric also ring true for healthcare providers: while you strive to offer the best possible care, it’s impossible to please every single patient. Eventually, even the most highly rated providers and facilities will get a bad review. When a negative review comes along, it’s only natural that you want to do something—either to rectify the situation or minimize the review’s effect on your reputation. However, dealing with patient feedback in the medical world is complicated—not only are the stakes high when it comes to maintaining your reputation, but there are patient privacy issues to consider. Getting the occasional poor review can benefit your organization. 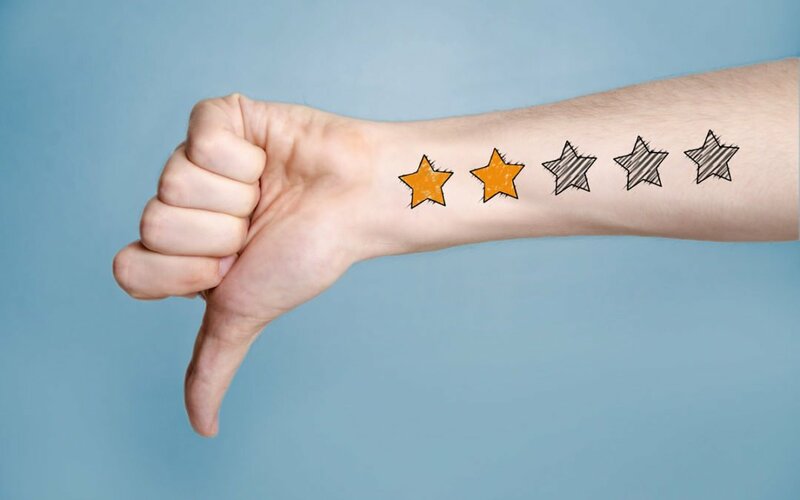 It’s called the “blemish effect.” Nobody’s perfect, and people take that into consideration when choosing a cosmetic provider—a smattering of negative reviews among dozens of stellar ones makes your ratings more believable. In fact, research shows that businesses that display a full distribution of verified reviews across a 5-star rating system, including a small percentage of 1 and 2 star reviews, are considered most trustworthy. Now, should your team respond directly to a negative review? HIPAA applies to reviews; put patient privacy first. Regardless of whether a review is anonymous or not, you cannot disclose any protected health information in your response, even if the patient does so in their review. If you feel certain statements ought to be clarified, do not refer to specifics of a patient’s treatment. Err on the side of saying too little. What you can do is clarify your company’s treatment standards by stating the policies or approaches that you apply to all patients. Respond, don’t react. An emotional reaction is far more likely to unintentionally exacerbate a touchy situation. Keep calm and respond thoughtfully. Try drafting your response, and then let it rest for a day and have a cool-headed colleague proofread it. Although a timely response sends the message that you care about your patients’ feedback, waiting one or two days isn’t likely to do any harm. Be brief, polite, and professional. Perhaps we are preaching to the choir here, but keep your responses civil at all costs. Your public response to a review will impact how other patients view you or your organization. Avoid long explanations, which could come across as defensive. Be careful about apologizing. Stating an apology could have legal ramifications in certain situations. For instance, if a review claims malpractice, any apology about not meeting that patient’s expectations could be used against you. Acknowledge the reviewer’s feelings by thanking them for taking the time to share feedback, and reiterate your commitment to providing an outstanding service. Know when to take things “indoors.” Sometimes, the best response is to invite the patient to contact you directly to discuss the situation. Trust your instincts—if you sense the beginnings of an online battle, or you cannot adequately address the review without discussing personal information, take things offline. You might even gain a fan in the end: when a company is able to repair a relationship with a patient who was previously disappointed, they often become doubly committed to your providers and update their review, knowing you’ll go the extra mile to make them happy. Be extra careful when responding publicly to anonymous reviews. If a patient leaves an anonymous review, he or she is doing so for a reason—they don’t want you to know who they are. In this case, if you do wish to reach out, a simple “thank you for your feedback, please contact us to discuss your concerns in private” is sufficient. If possible, do this via direct messaging instead of leaving a publicly visible comment. If the reviews platform promises a totally anonymous user experience, a personal response may not be appropriate. In this case, follow the advice below. Often the most constructive response to a poor review is to use it to better your practice. Assess the issues brought up in the review and see if and how they expose any areas for improvement. Even if the bad review seems out of line, it could serve as a motivator for you and your staff, helping to “keep you on your toes” and recommit to your mission to provide outstanding care. What if a review contains false information? What if you receive a review that you believe is flat-out wrong—the writer makes malicious claims or false statements about their encounter with you? In this case, it is reasonable to want the review taken down. However, doing so is easier said than done on many social media sites (this is why building a dossier of verified reviews is critical—both you and potential patients can be sure that the reviews they read are from actual patients). First, distinguish between opinion (i.e. “Dr. Smith is terrible”) and factually incorrect information (i.e., “Dr. Smith gave me half the Botox I wanted” when that provider does not offer Botox injections). If you have evidence to refute incorrect statements, you may be able to get the review deleted by contacting the reviews site administrators. If you cannot supply concrete evidence contradicting the reviewer’s claims, you may have a hard time getting the review removed. In this case, you may wish to post a publicly visible comment to the review, following the guidelines above, if the platform allows for it. You can work to avoid and counteract “fake reviews” by investing in a ratings and reviews strategy that uses a third party to gather statistically valid, verified reviews from a broad sample of your actual patients. Poor reviews are inevitable for even the most highly ranked healthcare providers. If you want to learn more about strategies for having accurate reviews online—and driving more patients into your practice—we’d love to help. Contact us online to discuss more.